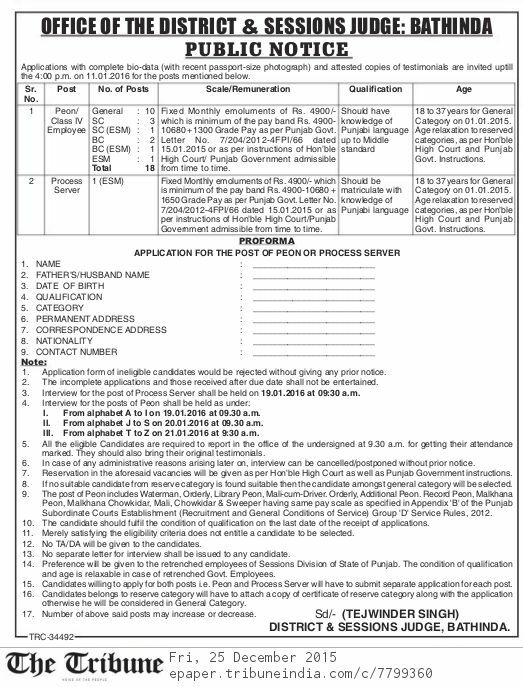 District & Session Court Bathinda recruitment notification released for Contract basis Peon & Process Server Posts. All eligible candidates have to apply before 11.01.2016. Check the eligibility criteria, selection process, job description & other details given below. Salary : Selected candidates will be paid Rs. 4900 – 10,680 + Grade pay Rs.1300. Required Qualification : Candidate must passed 8th Standard & must study Punjabi language. Interview Schedule : Candidate will have to attend interview on 19,20,21 Jan 2016 at 9:30 am. For more info download official notification. Age Requirement : Candidate’s age should be 18 – 37 years. Required Qualification : Candidate must passed 10th Standard & must study Punjabi language up to 10th. Interview Schedule : Candidate will have to attend interview on 19.01.2016 at 9:30 am. Eligible candidates should have to apply fill application form in given or prescribed format & send it to District & Session Court (Bathinda) along with attachment of their photographs & required documents before last date 11.01.2016. For more info download official notification from below. I want to job in Punjab.government.for driver job.Please help me.I am BA.pass g.